If you are looking for something good to cook tonight that your whole family will like, try our healthier version of Chicken Parmesan. It is also a great dish for entertaining dinner guests. It is tasty, easy to prepare ahead of time, and looks impressive to your guests! 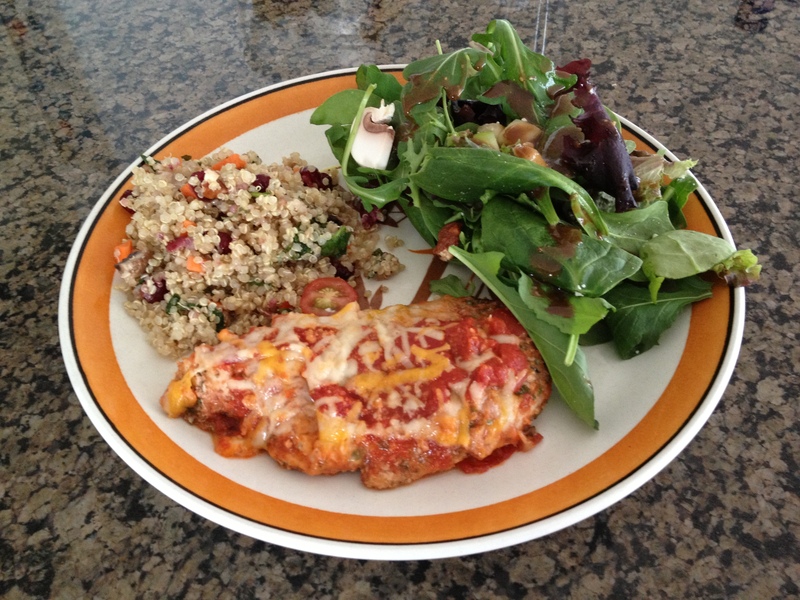 For a PDF copy of this recipe, Chicken Parmesan. Prepare coating for chicken by combining almond meal, wheat bran, parmesan cheese, parsley and salt and pepper. Drizzle olive oil over chicken cutlets and toss to coat. Dredge oiled chicken cutlets into coating. Use parchment paper or coat 8 x 11 or 9 x 13 baking pan with oil. Spread sliced onions at bottom of pan. Spoon 1/3 to 1/2 cup of tomato sauce at bottom of pan. Place coated cutlets on top of onions and sauce. Spread/drizzle remaining tomato sauce over top of chicken cutlets. The sauce will not cover the chicken entirely. Sprinkle shredded mozzarella (or preferred cheese) over chicken. Bake chicken at 400 degrees for 32 to 35 minutes. Serve with mesclun salad and vegetable quinoa.